A large clay pot, bearing crude drawings, made from a clay slip painted onto the clay body, showing people hurting each other, accompanied by other scenes. That’s what you see and that’s what there is. It’s a story, a narrative. This is all about narrative – story-telling. It’s what we do. Our blog posts here are narratives, telling stories about places or objects or experiences. They serve to present aspects of our expert-led archaeological or cultural tours and cruises, during which our guides create narratives and tell stories to explain the areas we travel, their histories, traditions and more – to bring them to life in the minds and eyes of our guests. In many cases, the very things we show our guests bear narrative content in themselves. This is a prime example. A few days ago, I had the opportunity to show our guests on “Cruising to the Cyclades” around the archaeological museum of Parikia, a beautiful town on the island of Paros. 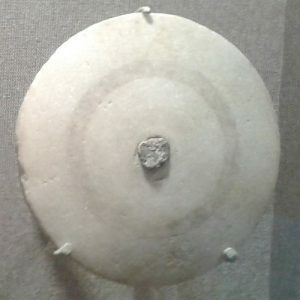 The museum is home to a smallish but excellent collection of artefacts from various excavations in and around the great ancient Greek Island city-state of Paros. Paros itself is a reasonably large island in the Cyclades, and it was a regional power for much of antiquity, but especially in the 7th and 6th centuries BC, the Archaic era. We have much to show in the museum: some typical and mysterious Cycladic figurines, excellent sculptures (a thing Paros was famous for, just like her neighbour Naxos), bits of monumental architecture, and also much pottery, some of it painted. The vessel in question is an amphora, a shape that usually describes a storage or transport vessel for liquids such as oil or wine. Of course, amphoras used for storage or transport were not normally decorated. And indeed, our amphora is not a normal one: it was found in a cemetery and it contained the cremated remains of a person. A burial amphora, in other words. It dates to some point not long after 750 BC. That’s an important date. By that point, for about three centuries, Greece had been producing very nice and accomplished pots of various shapes, many of them painted, but all of them bearing exclusively geometric decorations: lines, zigzags, borders, circles, meander patterns, and so on – no figures at all. Only a few generations before our Parian pot, vase painters across the Greek World had started adding figures, such as birds, horses and eventually very stylised humans to those patterns. Around the mid-8th century BC, they broke through whatever barrier or rule had restrained them and started painting funerary scenes, such as processions, the laying-out of the dead, mourners and so on: quite generic, but highly appropriate for burial vessels. Athens in the Greek Mainland is considered one of the sources of this new beginning of figural art, preceding the development of Greek sculpture, the writing of Homer’s epics and so on. Be that as it may, the idea of painting scenes that tell a story must have reached Paros early and must have inspired a craftsman – or should we call him an artist? – of pioneering spirit to create our object, telling a story by using his vase in an innovative way. The belly of the amphora shows two groups of warriors approaching one another, with archers on the left, slingers on the right and a dead or fallen body in the middle. It’s crude but clear, and the marching warriors already show the features that will define the Greek hoplite, the citizen warrior, a century or more later: shield, helmet and two spears. The artist even paints their shields differently, to give them individuality, or so one assumes. Maybe his drawing meant to depict people he knew. The central figure is – most unusually – a fallen one, and it really does appear to be the subject of the scene – something that later Greek art would not ever permit: “our own” are not shown in defeat. 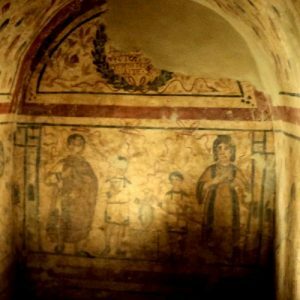 The fallen body is repeated in light-on-dark paint right above on the amphora’s shoulder (difficult to make out, but marking another innovative idea by the vase’s painter). Much more clearly, he is seen one more time, right above the other images of a fallen body again, lying dead on a burial couch (we have very similar imagery from Athens) on the vessel’s neck, surrounded by mourners (men raising their hands in lamentation, women pulling at their hair), and with a (male?) figure apparently trying to pull an arrow from his neck or head. The burial image of a body on a couch surrounded by mourners is conventional in Athens and elsewhere at the time, but it is usually the main motif, associated with (funerary) processions, but not with fighting scenes. The conjunction of scenes on the Paros amphora is unusual, with the fallen figure repeated thrice, one above the other, suggesting a linear narrative: a person killed in battle, laid out and mourned. The fact that the vessel is a burial one strongly suggests that we are looking at a tale about the buried individual himself. 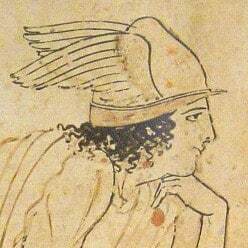 We have no idea what battles Paros fought in the 8th century BC, and we probably never will. Also, we have no name for our cremated and depicted fallen warrior; we will never know who he was, what he fought for, against whom he did so, for what cause, or even who mourned him and buried him – and thus commissioned the amphora holding his remains: his parents, his wife, his friends or peers, his children? For us, he simply and starkly remains the fallen warrior whose story is depicted, clearly, perhaps crudely, on his burial amphora. Maybe his story was a common one at his time, but it remains a story never again told quite like his. Whoever he was, he is it the very beginning of Greek and European story-telling and thus his story, told like a comic-strip, image by image, is both a personal end and a cultural beginning. 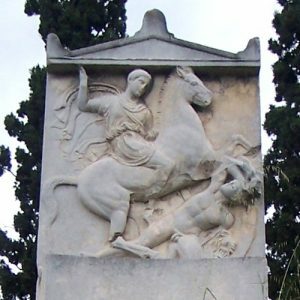 The Parian warrior’s story is unique and he deserves respect for whoever he was and whoever had him commemorated. We have many unique stories like his to tell and to show, each of them bringing us in touch with past human endeavour and with the often nameless people behind it, their values, their emotions and their lives. To meet our lost Parian warrior and his vase in person, you can join us on Cruising to the Cyclades and discover the beauties of Paros and many other islands. To find more stories of this kind and beyond, you should look out for our itineraries in Greece and Turkey to start with, and everywhere else we go. Story-telling, using artefacts, museums, sites, islands and whole regions is what we do, expanding a narrative from the very very rock we stand on to the many avenues of history that start from there or that lead there. Come join us to find your own stories!